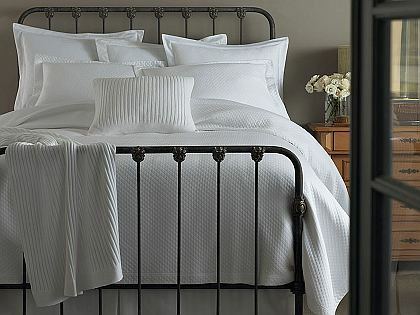 The Peacock Alley Oxford diamond matelasse is a classic understated basic that brings a chic touch to your bedding ensemble. Matelasse is a weaving or stitching technique that produces a pattern that appears quilted, but is actually only one layer. The result is a thin coverlet that provides both extra warmth and texture. Oxford is available in White or Ivory and with either a scalloped or tailored edge. This two-tone bedding is made in a 305 thread cotton sateen. 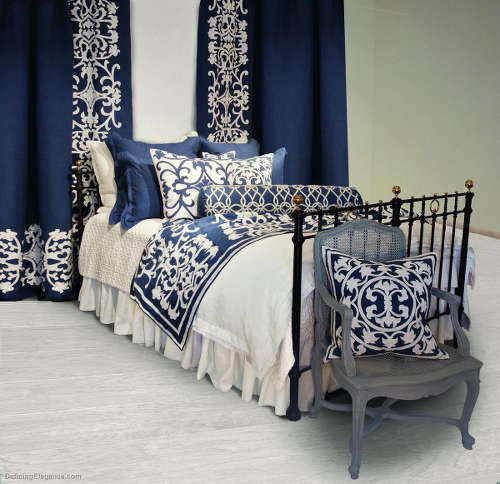 Luxurious and rich, the neutral colors of the Alexandre Turpault Gabriel bedding collection work with many types of decor. The shams have a two-tone double flange and the duvet cover has a two-tone front with a 20″ border at the bottom, and reverse in the same color as the border. Although lovely as is, we find that by accessorizing with the Alezan faux fur throw and decorative pillows instantly heightens the glamour quotient of this bedding. This sophisticated geometric 500 thread count 100% Egyptian cotton bedding collection from Signoria defines modern elegance. Pianosa is enriched by a chenille yarn and the circle pattern is both soft and understated. It’s available in two colorways – white/ivory or ivory/espresso. Coordinating shams in white with 4 lines of embroidery is the perfect companion. See Signoria Pianosa fine linens and other collections by Signoria Firenze on DefiningElegance.com. This beautiful applique pillow collection from Lili Alessandra includes combinations of navy blue/silver, navy blue/white, white/navy, or solid navy. The designs are elegant and add glamour to any room setting. These pillows are also in stock and ready for immediate delivery.